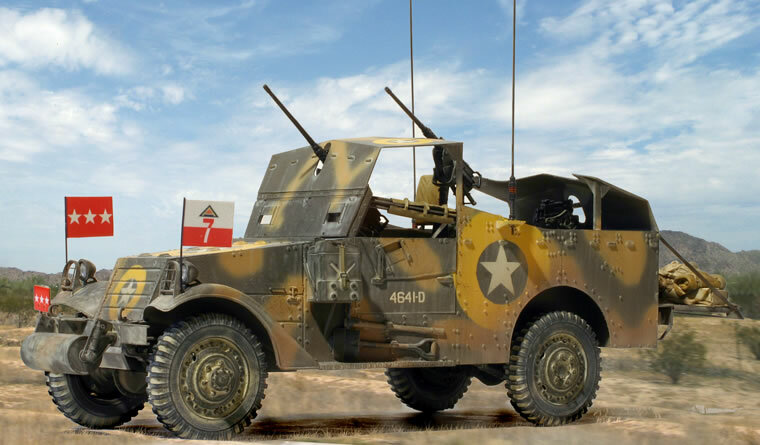 I have been planning to build Patton's Seventh Army M3A1 Scout Car from Operation Husky, Sicily configuration for several years now. I picked up the Hussar resin wheel set at AMPS in Havre-de-Grace this past April, so that was the final excuse to get this project rolling. 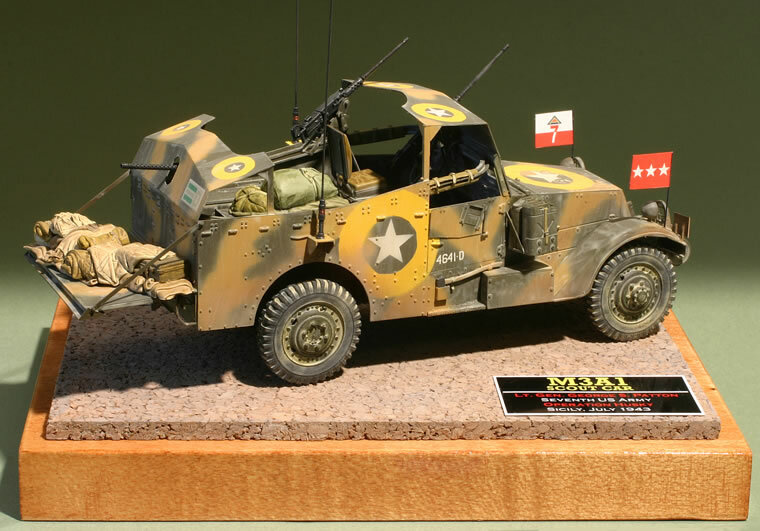 The base kit is the old Peerless-Max M3A1 which came out in the early 1970s. I remember when I first saw the kit back then, I thought it was a major step-forward in quality. However, by today's standards it's pretty rough with soft detail and very thick side walls. I used an Italeri pop of the kit, but it's come out numerous times from various manufacturers. The Italeri kit I used had the same nasty, brittle plastic as the original. The main issues with the kit are the thick rear walls, thick machine gun skate rails, and mediocre small detail. To deal with the first two issues, I completely rebuilt the back end from sheet plastic. This isn't as bad as it seems because you can use the kit parts as a template. I scratch-built a new skate rail, but it is possible to adapt the Dragon M2 half-track rail with some cutting and grafting. For the small detail, I pillaged my growing box of Dragon half-track bits. 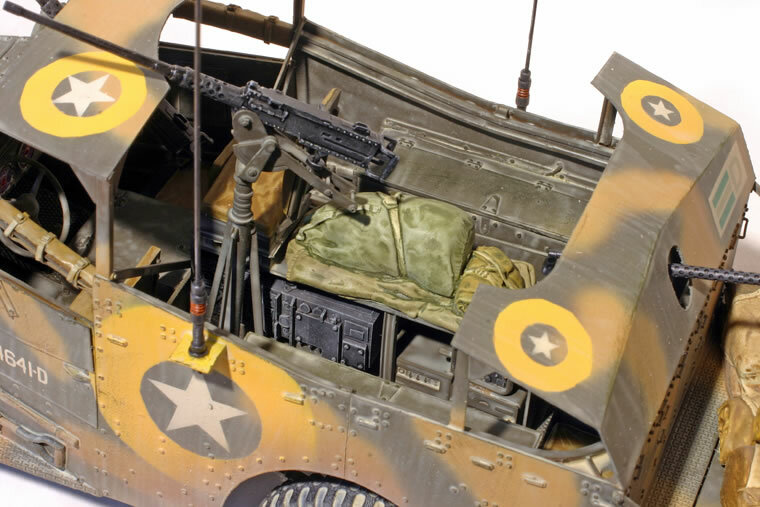 Patton's command car had a variety of changes including a radio console running down the center, an added pintle-mounted .50 cal machine gun, and armored shields on the front and back. Details of the radio console are scarce and involved a fair amount of guesswork. The paint scheme is the usual Husky scheme of earth yellow over olive drab. I mixed the earth yellow from Tamiya desert yellow and some orange and brown. I masked an airbrushed the Husky stars with the big yellow surrounds. The ETOUSA-POM marking on the back and the command pennants were made using Testors decal sheet and my ink-jet printer. 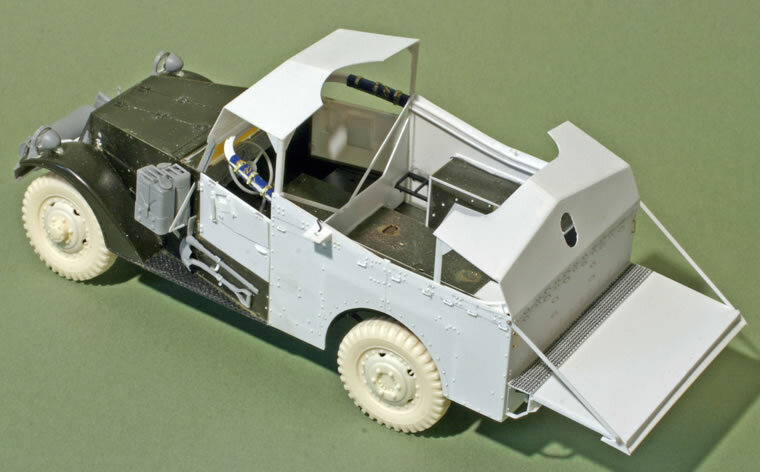 For modelers not wanting to tackle this elaborate scheme, it would be possible to do the same conversion in the plainer Tunisia markings. 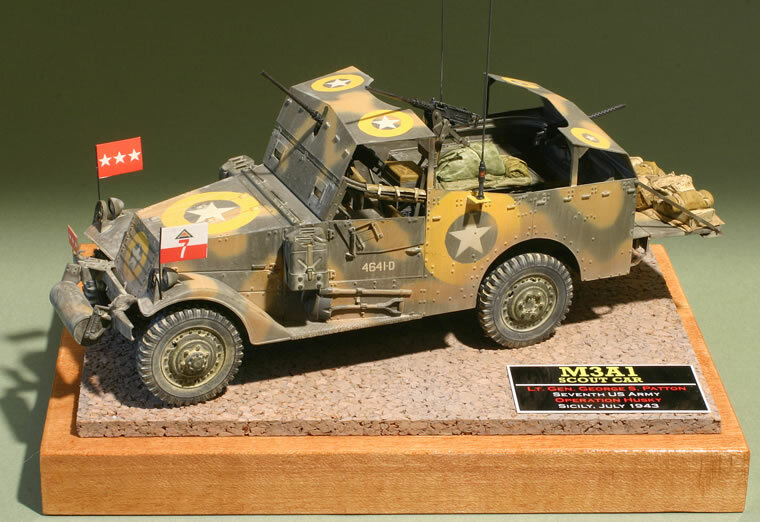 More details of this project and the M3A1 scout car will appear in my article in Military Modelling.